The name may be the same, and they are sharing a summer on the global sports stage, but otherwise there aren’t many obvious similarities between FIFA’s World Cup (soccer) and FIBA’s World Cup (basketball) — the latter of which tips off this weekend in Spain. While the World Cup played on grass is definitely the biggest event in its sport — arguably the biggest event in all of sports — the World Cup played on hardwood doesn’t have quite the same pull with the players or with the public. For example, the recently-completed World Cup in Brazil featured just about every active big-name soccer standout on the planet. This World Cup in Spain, however, apparently wasn’t deemed important enough to lure LeBron James, Kevin Durant, Carmelo Anthony and Tony Parker, among other NBA superstars. That said, it should still be an entertaining two weeks of basketball, in part because the not-so-stacked Team USA isn’t as much of a lock to easily win the gold medal. Kenneth Faried, PF, United States: To be honest, Faried probably wouldn’t have made the roster if Durant, Kevin Love and Blake Griffin hadn’t taken a pass on the World Cup. But now that he’s on the squad, he’ll make his mark as Team USA’s designated “energy guy,” finishing fast breaks, cleaning the glass and making the hustle plays that his bosses with the NBA’s Denver Nuggets won’t want to witness. Omer Asik, C, Turkey: With longtime NBA and national-team veteran Hedo Turkoglu sitting this summer out, Asik takes his place as the focal point of Team Turkey. After serving one unsatisfying season as Dwight Howard‘s backup with the Houston Rockets, Asik has since been traded to the New Orleans Pelicans and is the front-runner to start in N.O.’s frontcourt alongside Team USA’s Anthony Davis. Gorgui Dieng, C, Senegal: One of the biggest surprises of the NBA’s 2013-14 rookie class, Dieng started slow, but once he cracked the Minnesota Timberwolves’ starting lineup he did enough in the final two months of the season to make the league’s All-Rookie Second Team. In a game against Houston on March 20, Dieng put up 22 points and 21 rebounds in just his third start, and during the month of April he averaged 11.9 points, 10.7 rebounds and 2.0 blocks. Ibrahim El-Gammal, SG, Egypt: He’s a gunner, and not a particularly accurate one, but El-Gammal has his moments where he can fill it up. Think of him like the Egyptian Vernon Maxwell. At the 2013 FIBA Africa tournament, El-Gammal fired off 97 shots from the field in just seven games, hitting only 22.7 percent of them. That included a 7-for-44 clip from three-point range. But he was good enough to help Egypt to a silver-medal finish, and is the team’s leading returning scorer from its gold-medal loss to Angola. Hamed Haddadi, C, Iran: The first-ever Iranian NBA player hung around for five years in the league as a little-used backup with the Grizzlies and Suns. But on the international level, the 7-2 giant has been Iran’s anchor. Haddadi averaged 14.8 points, 8.7 rebounds and 1.8 blocks at this year’s FIBA Asia Cup, which is actually a dip from his usual double-double stat line that often flirts with 20-and-10 territory. It’s not like Haddadi is past his prime, though; he’s only 29 years old. But as Iran continues to improve as a team, he doesn’t have to do as much every time out. Mamadou N’Doye & Maleye N’Doye, PG-SF, Senegal: I haven’t been able to confirm or deny that the 6-3 point guard (Mamadou) and the 6-8 small forward (Maleye) are brothers. But whether they’re related or not, the two 34-year-olds (born 10 months apart) are a tandem whose talents are crucial to Senegal’s success. 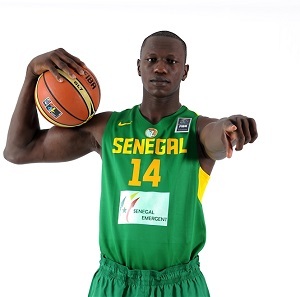 At the 2013 FIBA Africa Championship, at which Senegal won bronze, Maleye was the team’s leading scorer while Mamadou led the team in assists. Kerem Gonlum, PF, Turkey: At 36, he’s elder statesman of the Turkish team and one of the handful of holdovers from the squad that claimed silver at the 2010 FIBA World Championship. Gonlum is a Taj Gibson-type who always seems to be around the ball and the basket at the right time, scoring on putbacks and plays that aren’t initially run for him. He can also step back and hit jumpers from the perimeter; the kind of stretch four that can give teams fits who can’t defend the pick-and-pop. Edo Muric, SF/PF, Slovenia: A three-time All-Star and four-time champion in Slovenia’s Premier A league, Muric is an athletic wing who can run the floor and finish above the rim in traffic. A regular standout on Slovenia’s youth national teams, he’s now 22 years old and poised for a breakout with the grown-man squad. Mahdi Kamrani, PG, Iran: One of those guys you hate playing against but love having on your team. Kamrani is a perpetual-motion pest on both ends of the floor who is constantly moving, cutting, bumping and swiping at whoever is guarding him or being guarded by him. He’s been a consistent double-digit scorer for Iran over the years, gaining experience in the Olympics (2008), the World Championship (2010) and a handful of FIBA Asia Championships. At the 2013 FIBA Asia tourney, Kamrani averaged 10.3 points and 6.6 assists, including a double-double against Jordan (11 pts, 11 asts) and a 15-point, 7-board, 5-dime effort against the Philippines.